Many couples come to Cabo thinking that just because they are getting married in paradise, their destination wedding will be a breeze. However, a wedding is one of the most important days of your life and when you are having it in an unfamiliar location (no matter how beautiful), it’s best to rely on the experts. 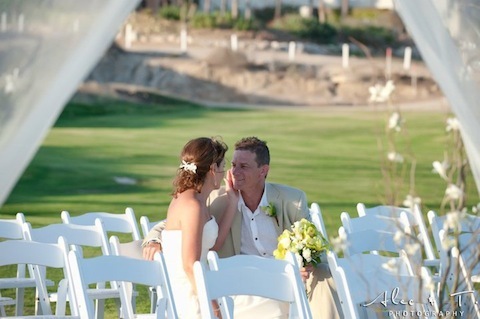 Those experts are Cabo wedding planners like Coleen and John Fagan who founded Baja Weddings. With local knowledge, a wedding planner in Cabo can help the bride and groom find everything from the perfect wedding cake to the photographer who will take those priceless pictures. At Baja Weddings, Coleen helps with the design of the weddings and trains the on-site coordinators. John, who goes by Padre Juan or PJ, is a certified minister. When Coleen and John first visited Cabo in the ‘90s, they fell so in love with the area that they decided to move there. The couple packed up from Boise, Idaho and headed to Cabo with the goal of an early retirement in paradise. The dream continued into their second year as Cabo residents when Coleen and John were married at a beautiful sunset wedding – in Cabo of course! Thus, they started Baja Weddings. 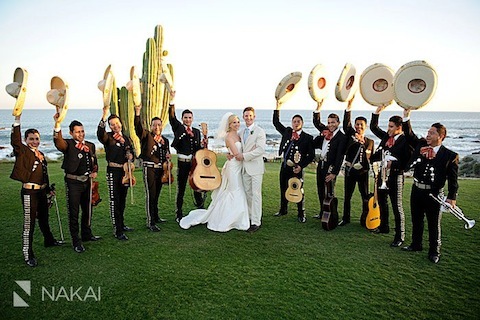 Over the years Baja Weddings has built a reputable business as a Cabo wedding and event designer and grown a sizable staff of designers and on-site coordinators. After talking with Coleen, here are some of the reasons why a bride and groom should choose to have a wedding planner help them with their destination wedding in Cabo. Most Cabo wedding planners know the ins and outs of the wedding industry and are there when you need them. Baja Weddings trains their designers and on-site coordinators extensively so that you that you know you’ll be in expert hands. They are trained to stay with you from the planning to the follow up and handle everything from last minute additions to unpredictable incidents. “I’m not an on site coordinator; I am a minister and I feel sorry for these couples,” says PJ. 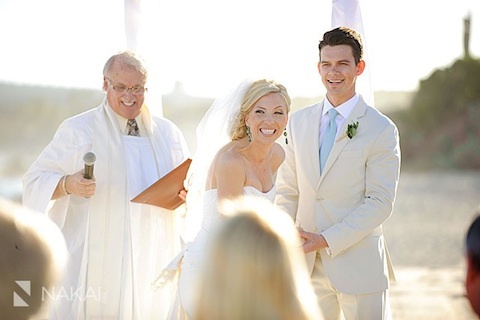 Baja Weddings’ well-trained event coordinators are hands on throughout the entire process. You do not have to worry about them having other responsibilities – they are focused on your wedding. Baja Weddings has tried helping with just parts of a wedding (i.e only helping find a photographer or flower vendor) but found that it just doesn’t work. “When couples attempt to hire their own vendors without us, they find that sometimes the vendor is late, inappropriately dressed or, even worse, does not show at all. We loose control and the bride and groom of course are very disappointed” says Coleen. This trust carries over to the relationship Baja Weddings has with their clients. Coleen estimates that only about 30% of her clients visit Cabo before the wedding to do tests of the vendors and visit the venue. Her wedding designers build the relationship via emails and telephone calls throughout the planning process. “Once you build that relationship, the client usually trusts us,” says Coleen. By the time your wedding is complete, you will feel like family. Baja Weddings even follows up after the wedding to see how the couples are doing. But the trust is really built in the details. It’s the knowledge and experience with the small things that really makes a Cabo wedding planner invaluable to the bride and groom. At Baja Weddings, every aspect of the wedding is important. Whether it’s the flavor of the cake or the seating arrangement, you can have a guarantee that a lot of thought and planning went into it. Having knowledge of the area can help prevent disasters such as ruined favors or flowers. Wedding planners have the experience of working in Cabo to help you with small details that you might not have thought about. Experienced wedding planners can tell you that flowers are imported from Mexico City and pretty much anything is possible. However, some flowers do not do as well as others in the Cabo heat. Need to know where to find those wedding favors? Or how to get them to Cabo from home? Your wedding planner can help. Coleen says sombreros, sarapes, maracas and little bottles of tequila make great signature Cabo wedding favors. And you can find them all in Cabo. She also suggests that if the wedding party is bringing favors, not to ship them. “It might not arrive on time,” she says. “Or at all. When it comes down to it, having someone help you with the most important day of your life is invaluable. You can rest assure that if there is a problem with your venue or vendor that it will be solved as soon as possible. Your wedding planner will make sure that everything flows smoothly when you get down to Cabo. Using a wedding planner in Cabo can also help you come up with ideas that you might not have thought of. Whether it’s suggesting a type of flower based on your color scheme or coming up with an unique favor, Cabo wedding designers have the ability to design the perfect wedding based on your dreams. As for unique a wedding in Cabo, Coleen mentions that John dives. “We have a diving option, but no one has taken us up on it yet,” she laughs. Your Cabo wedding is a once in a lifetime experience. There’s no reason that you shouldn’t have help from the experts to make your dreams come true. 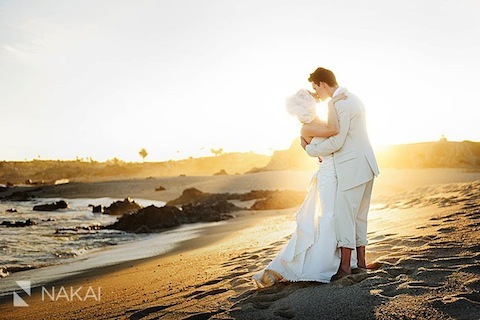 What’s your dream wedding in Cabo? Disclosure: Baja Weddings is an advertiser of All About Mexico. 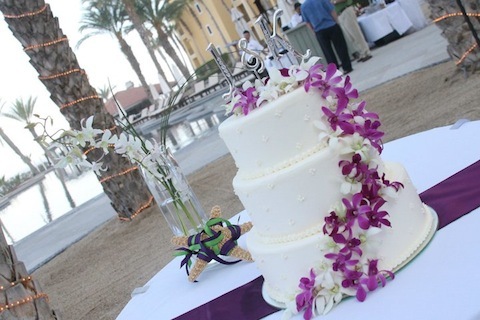 Photos courtesy of Baja Weddings.